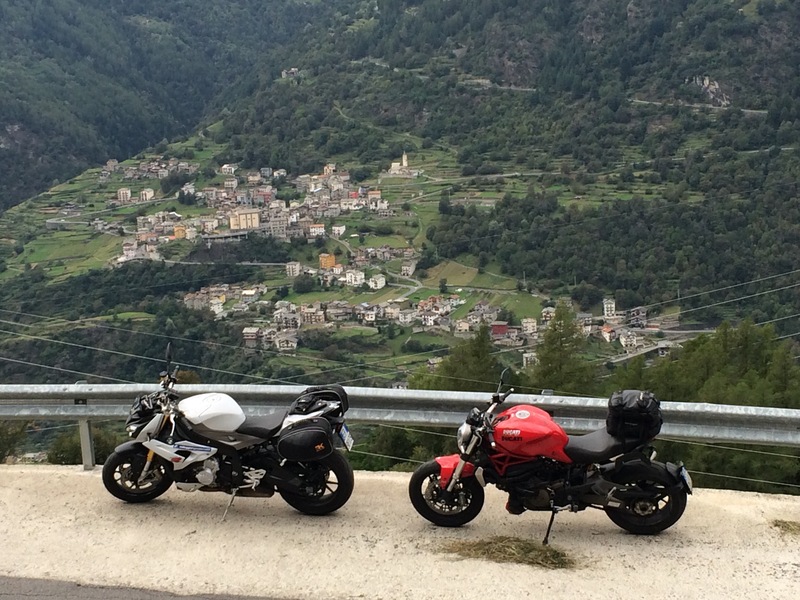 A week on any bike in the Italian alps is a dream vacation. 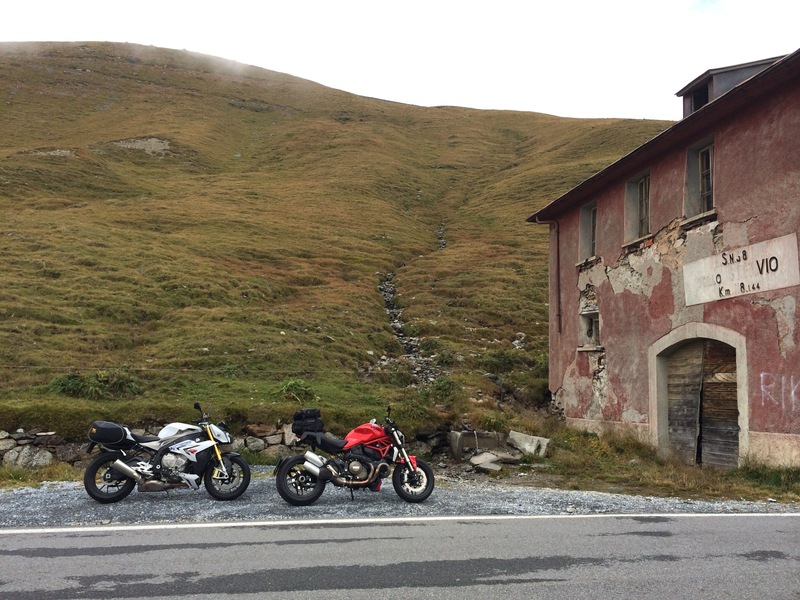 In this case, the bike at hand was the 2013 BMW S1000R and after screaming its inline 4 through speed limit-less mountain passes,we’re ready to share some thoughts about BMW’s super naked. We picked up a pair of bikes in Milan, the accompanying steed being a 2013 Ducati Monster 1200, ridden by Mrs. Chance of ChanceMoto. I immediately became comfortable with the S1000R’s smooth throttle response, the bike exhibiting a very linear and progressive power curve that was docile at city speeds and low RPM. As we made our way out of the city and onto the highways heading north, I had a chance to begin opening up the Beemer. It’s here that the bike’s split personality began to reveal itself. Pinning the throttle as I rounded the on ramp, the revs climbing from 2,000 RPM left me wondering when this “beast” was going to wake up. The answer lies at 6,500 RPM, where the motor springs to life and starts wailing like a banshee into the 5 digit RPM’s. There’s no doubt in my mind that all 160 of the bike’s horses are there, you just have to know where to look for them. The top half of the rev range is incredibly strong, but still maintains the linear nature and predictability found at lower RPM. Dr Jeckyl and Mr Hyde indeed. To ride this bike fast, you’ve gotta keep it on the boil which is something prospective buyers will either love or loathe. After half a day on the bikes, we exited the freeways for lunch, fuel and a stretch. Whereas Mrs. Chance was happy as a clam aboard the sure-footed, cruiser-like (in comparison) Duc, yours truly was a little more out of sorts. The constant buzzing of the inline 4 had inadvertently put my hands to sleep and that feeling persisted long after I’d enjoyed my prosciutto sandwich and espresso. Over the course of the week, this became my main gripe with the S1000R. It’s probably something an owner of this bike could cure with different bars, bar end weights or ball bearings and a tube of liquid silicone -but I was stuck with it for a week and it hampered the bike’s all-day touring potential. Back on the bikes and up the mountain, I began experimenting with the host of electronic aids the bike was equipped with. Primarily, the ride modes and corresponding electronic suspension settings. Over the course of the week, this proved to be a revelation -particularly the electronic suspension component. Riding with suspension on the “soft” setting, potholes disappeared and the bike transformed into a plush and compliant ride, ideal for taking in scenery. When that gets boring, switch to the “sport” setting and you can literally feel the bike tighten up underneath you, like a cheetah getting ready to pounce. This proved to be my chosen setup for carving the mountain passes and combined with the quickshifter, made for a deadly weapon. If there was ever a doubt in my mind that electronic suspension is the future, it has been laid to rest. I’m a believer. The chassis too is worthy of praise. By the end of the week, I was comfortable enough on the bike to exit corners with the front end skimming the ground with the rear tire clawing at the pavement for traction. Without a doubt, this is the type of bike that makes you feel like a better rider than you are. I can only imagine it would be right at home at the track, with such a sure footed and confidence-inspiring front end could go to work. Then, there’s the heated grips. There was snow on some of the mountain peaks we rode and the Mrs. was insanely jealous of my OEM heated grip arrangement while she froze her hands off. Every motorcycle should come with heated grips. There, I said it. When it was all said and done, I returned the keys to the S1000R with mixed feelings. The bike offers a lot to love: screamin’ top end performance, amazing electronics and an extremely composed and confidence-inspiring chassis. The 2 main gripes I had were around the buzziness in the bars and the lack of any real excitement on the lower end of the RPM range. It would be hard to fault anyone for buying such an smart motorcycle…that’s exactly how I would sum up the S1000R. Stay up to date with our most recent news by following our blog (below) or find us on Facebook.